When it comes to sharing your DSLR video, YouTube is the de facto standard. 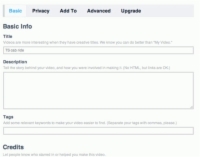 The video-sharing website lets users upload, view and share videos. It uses Adobe Flash Video and HTML5 technology to display user-generated video content like viral video, music videos, and movie clips. Content is provided both by media corporations and individuals. YouTube has more than 3 billion video views per day. That means your content has the potential to be viewed by a lot of people. Of course, they can only watch if they know it’s out there. If you’re not ready for such an audience, you can make your movies private and send would-be viewers and invitation to see it. It supports a variety of file formats and allows for some formats to upload in full HD. Video length cannot exceed 15 minutes, unless you verify your account. The videos you upload must be yours, or you must have permission to share them. If you do not have permission, YouTube can remove it at the rights-owner’s request. Uploading a video to YouTube is relatively easy. 2Go to top of page and click Upload. 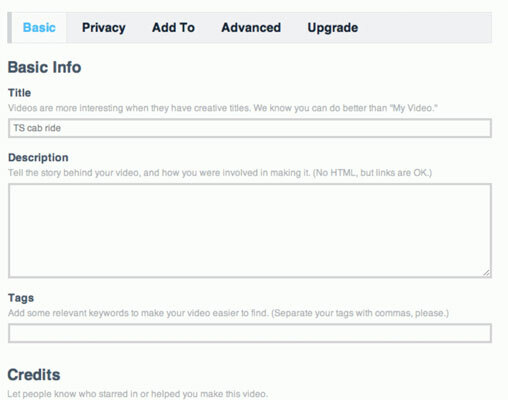 3Select the video you want to upload. The site offers several choices, including Upload Multiple Files, Record from webcam, and Select Movies from Your Computer. Choose the latter, and then click that choice and navigate to your video. Depending on file size and length, uploading can take an hour or more. Use this time to properly name the movie and fill out the Basic Info fields. Also keep an eye on the page views to see if you’ll have a viral favorite on your hands.